June 2017 – Awesome Tuna Action at Hannibal Bank!!! 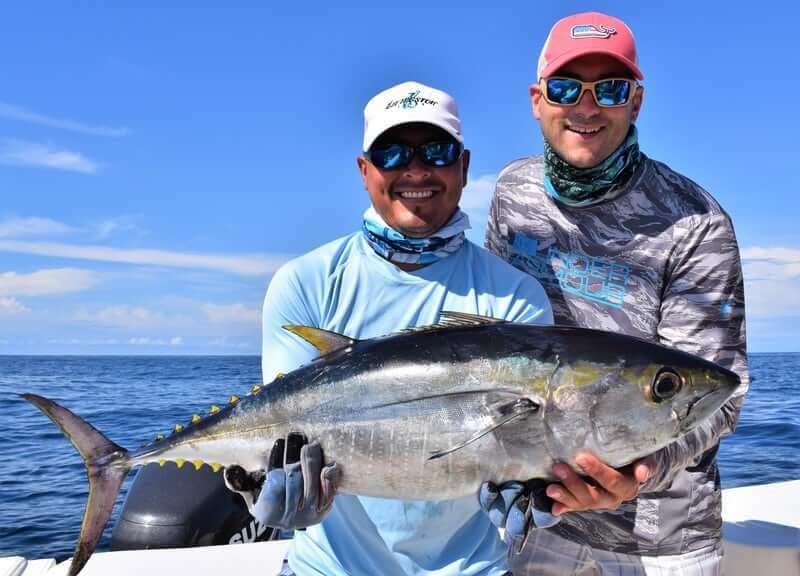 If you always wanted a shot at doing battle with a big Yellowfin Tuna then come and fish with us at Sport Fish Panama Island Lodge the month of June! For as long as I can remember the big Tunas really make a showing here in June and this year was no exception! Every year like clockwork big areas of spawning baitfish offshore move into the Gulf of Chiriqui and are hunted down by large pods of Porpoises that that have BIG Yellowfin Tunas in tow! The action inshore with the Roosterfish and other species always seems to be good as well. We hosted 4 great groups and fished 19 days in June 2017 and it is safe to say we pretty much slayed the Tunas everyday! It is not always “automatic”. We don’t just always run out, put a bait down, and two minutes later hook into a monster. Sometimes we have to put some work in to get the Tunas to hit our baits. Our first group that came in June from South Africa saw this first hand. Anton, Connie, Ian, Rihana, Wilma, and Stephan were real troopers! They stuck it out as we had some inclement weather move into our area the week they arrived. The fish were kind of spread out so we had to go out and look for them. These guys elected to fish two boats…Capt. Tatin and Pucho did a great job as usual with the clients on the “Scandalous” and my Mate Juan and I ran the “T.O.P. Cat”. Once we found the area the fish were hanging…it was game on! 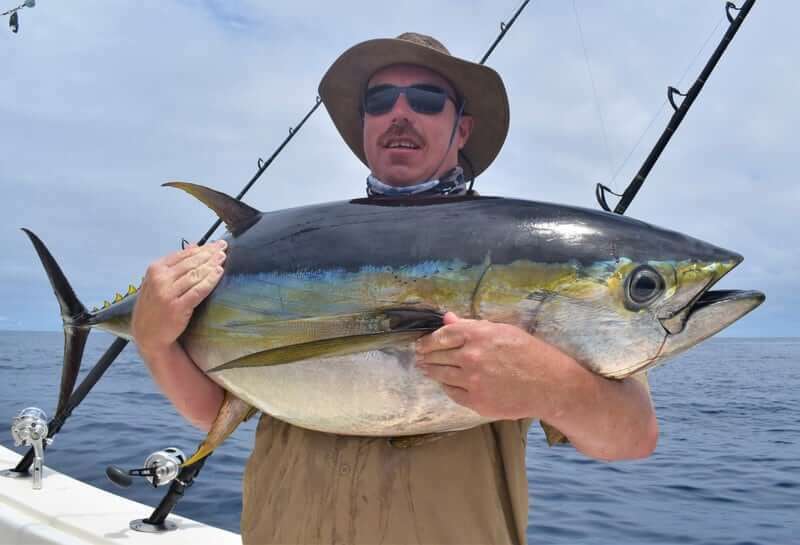 We had great day…after great day…with the Tunas and had some great luck releasing a few nice Roosters around the lodge here in the late afternoons before returning home. On the last day the weather turned real bad as soon as we got to our spot near Hannibal Bank. I marked a school of BIG Tunas underneath us on the SIMRAD sonar and then it started to rain cats and dogs! Then, not two minutes after we put our baits down, one of the reels starts to scream! It was raining so hard that you could almost not hear the clicker going off! Juan quickly throws the Accurate ATD-12’s lever to strike and BOOM!! !…we a hook into a big fish! It is absolutely blowing and pouring when we strap Ian’s wife Riana into the harness as the fish is ripping drag off the reel! Riana fights the fish like a champ for over an hour before Ian takes over. The fish keeps tugging at the 65# braided line for another hour and the rain eventually stops. Ian really puts the screws to the fish and we finally put the gaff into the monster! What a battle! The fish comes aboard and is all of 250 pounds!!! A real exciting end to a great trip with the awesome crew from South Africa! The next two groups were booked by our buddy Joao from Brasil. We fished two boats again for each group of 8 guys and we had a blast with these gentleman. The fishing continued to be great offshore with the Tunas and we again had great luck inshore as well. With both groups we were lucky enough to catch some big Yellowfin Tunas that wore these guys out! Also a great time back at the lodge as these guys were a lot of fun to be around! It seemed they really enjoyed hanging at the lodge and dining on our Chef Erick’s food as much as the fishing! Thanks so much for the business and looking forward to seeing you guys again next year Joao! 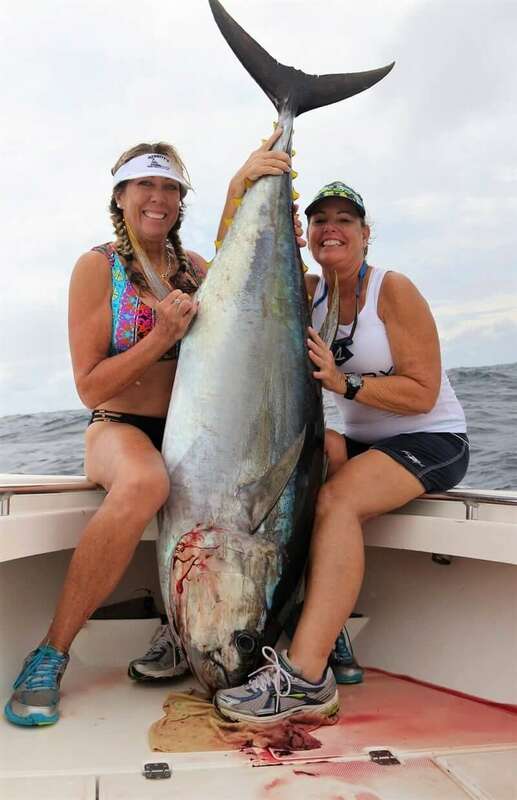 Robin and Michele wanted to catch a big Tuna and that’s exactly what they did! Capt. Tatin picked them up at their hotel’s dock on “Scandalous” one day on their day charter out of Boca Chica. Although the weather didn’t exactly cooperate that day the fish did! Tatin knew where the Tunas would be that day and they wound up hooking, doing battle, and catching a 200 pound monster! Congratulations girls! Last but certainly no least was Tim’s crew from Florida. These guys were just as lively as the Brazilians and great to fish with as well! There was no shortage of action and adventure with these guys! We had some great action fishing alongside the local commercial Tuna boats one day when they had the fish up and in a frenzy feeding mode! It happens pretty often this time of year…the commercial fisherman chum up big schools of feeding Tunas and we are able to slide in close to the action and hook up on Tunas in the middle of the action! These local fisherman, in their small 30 to 40 foot pangas, are specialists at specifically targeting Tunas on hook and line. Once they get the school of Tunas chummed up and feeding they start hooking Tunas one by one by pitching out hand lines set with pieces of bait. The big Tunas rise up and bust the bait right at the stern of the boat! As one of the crew members is hooking the fish…the Captain of the panga keeps the boat in gear moving forward while a couple of the other crew members keep throwing out pieces of chum. They keep letting out the main line off of the long line spool and the the school of fish keep following the boat and the pieces of chum. It is a pretty amazing thing to see as these guys hook into 100 plus pound fish one by one that are busting right at their feet! They keep hooking fish and setting out their long line until they school loses interest. When the action is over they go back and reel up the long line that is set with a bunch of hooked Tunas. This method of fishing Tunas by long line is very selective with virtually no by-catch of other species. Needless to say…it is very exciting to watch and a great opportunity for us to rush in, pitch a bait, and hook one of our clients into a monster! Other than the awesome couple of days offshore busting Tunas with Tim’s crew…we also had a bit of luck with the Roosterfish inshore near the lodge. And we had a great time hanging out with these guys eating Chef Erick’s awesome appetizers, super fresh sushi, and enjoying their special ordered…super smooth 15 year old Panamanian Abuelo brand rum! Thanks for the business guys and hope to see you back at the lodge soon!